Pinterest is full of images of painted cabinets these days. Why? Well, it is what DIYers love to see. The idea of sprucing up their kitchen and making updates with new colors and several layers of paint is appealing to them. The whole cabinet painting DIY project seems like a no-brainer. However, before you dive in nose first, there are some things you need to be aware of. Some mistakes and potential pitfalls you need to understand to avoid and have a successful kitchen cabinet painting. Below are some of the mistakes you need to avoid. There is no doubt that painted cabinets look good. No scratch that, they are a beauty to look at. However, the cabinets are not going to be smooth – at least not as smooth as you would want them to be. If your kitchen cabinet has open grains that are visible, the grooves will show through the paint. And even though it might not be so obvious when you stain the wood, the grooves will be much more evident when the paint has dried. To fix this, you can fill up the grain with some putty. Be warned that this can, however, be time-consuming and an absolute challenge to hack. Many people think that simple DIY projects are short tasks that they can take on when they are feeling lazy and have some extra time on their hands. They soon realize that this is not the case. DIY projects, regardless of how simple and straightforward they might seem, require at the very least 4 days. This is when you take some time to prep the cabinets and include the much-needed snack breaks to rest and bounce back. Regardless of how much of a clean freak you are or how clean you might think your cabinet surfaces might be, it is imperative that you wipe down every surface that you intend to work on using a grease remover. Failure to do this, your water based paint will not stick to the oil covered cabinet doors. Speaking of grease removers, using a paint prep degreaser, TSP is most recommended. Before you embark on the dirty yet very fun painting process, you should remove all drawers and doors. Remove all attachments to these parts as well. Some DIYers will try and save themselves some trouble and time by painting everything while the hinges and knobs are still in place and the drawers and doors are still attached to the cabinets. You should know that this is a short term fix. The hardware and the cabinets will start to chip and in about a month start to show signs of wear and tear. And the worst part about taking this shortcut is that once the paint on the hinges starts to peel, the only remedy is to sand the entire cabinet door and redo the painting. To save yourself the aggravation, you best do everything right. Everything and anything that you remove from its place will eventually have to be fixed right where it was found. To ensure that every piece goes back to where it was originally, use numbered labels. This will help you be precise in your replacements even when your memory fails you. A small piece of masking tape attached to the back of every piece will do the trick. 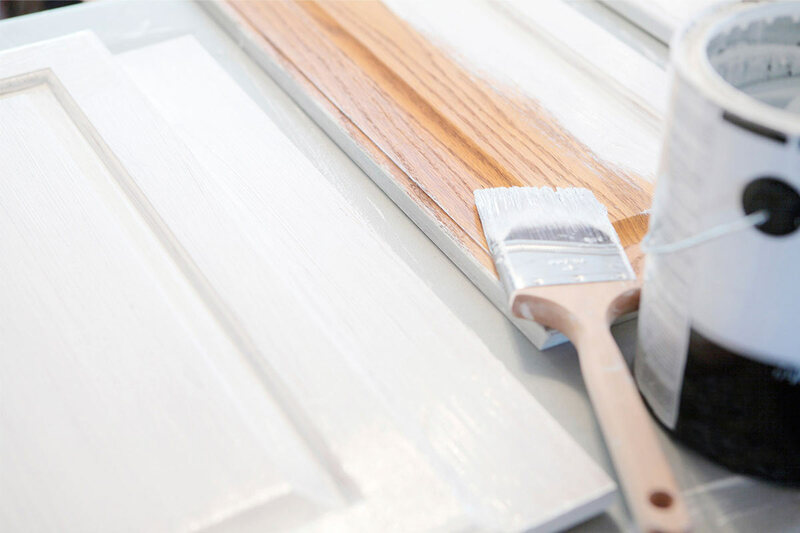 Even though your cabinets may be in almost perfect condition with regards to the paint, it is still important to sand them down before adding a new coat of paint of your preferred color. This will enable the paint to stick better and last longer. Using a sand paper with grit anywhere between 150 and 200 will do just fine. Remember the idea is to get rid of the glossy feel on the painted surface and not to sand down to the bare wood. This is a relatively easy process. However, if you want the sanding to be even faster, try get the best belt sander from Nutty DIY. You, however, need to be careful while using this not to overdo the sanding. It is a powerful tool and could easily get out of hand. It is good practice to vacuum the surfaces to get rid of any and all debris before you think of dipping your brush into a can full of paint. A few specs of dust could ruin everything for you. The finish will be gritty and will look as though you were painting on a surface full of sand. To correct this mistake, you would have to sand the entire surface and repaint it. Needless to say, this is one costly mistake you ought to avoid. This is one step most DIYers love to skip. But before you do, consider this. You currently have great looking cabinets freshly painted and looking good. The paint and great look lasts for about 3 months or even less and then you start to notice knots bleeding through the paint. To keep this from happening, make use of a primer that blocks stains and as the paint cures, you will not be surprised by blotches on the surface of the kitchen cabinets. Since it is your kitchen, one might argue that there isn’t any wrong or right color per se. However, for cabinets, you need to ensure that you get the color right the very first time you paint. Painting cabinets is an easy DIY project that any individual, trained or not can take up. But regardless of its simplicity, it is not a job you will want to be redoing soon when the color turns out to be off and not as you had pictured it. Before painting on cabinets, try out the intended color on a large poster board and hand it up next to your appliances and see if they bring out the effect you were looking for. It is easy to get caught up in the simplicity of a DIY project and totally forget the intricacies that make the project a success. Do not be one to ignore any of the above mistakes. But instead, learn from the mistakes of others and get professional results.